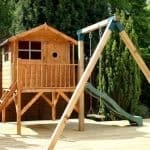 What a wonderful playhouse for a junior member of your family! 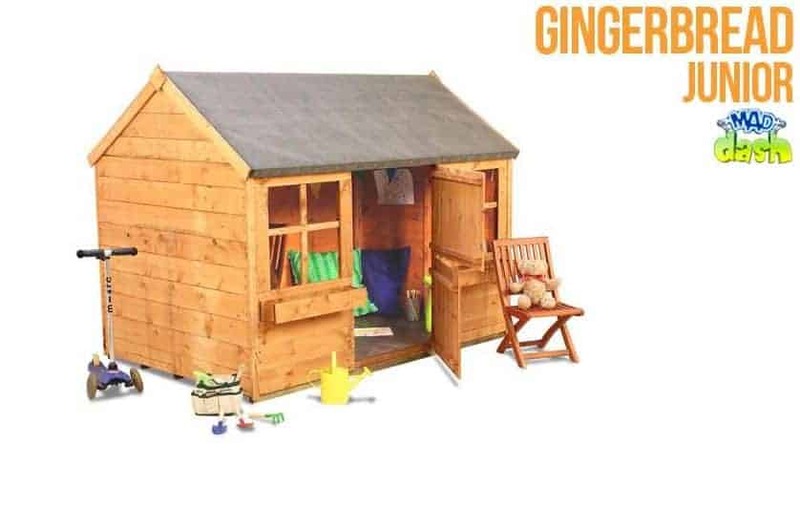 Suitable for preschool children aged 3 plus, this is styled as the traditional house, with two windows, a door and a garden. At an excellent price too for the amount of features and play options available. 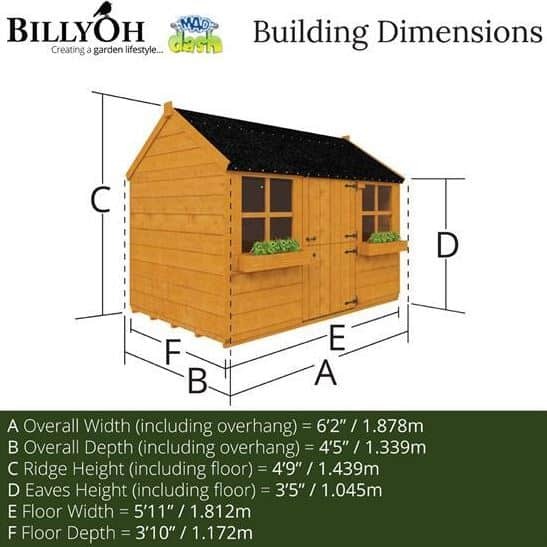 This is a one storey children’s playhouse constructed from hard wearing and long lasting, durable wood so it will stay the distance! The children will be thrilled with this traditional style playhouse which has feature windows, window boxes, a front door and if you choose, a picket fence. 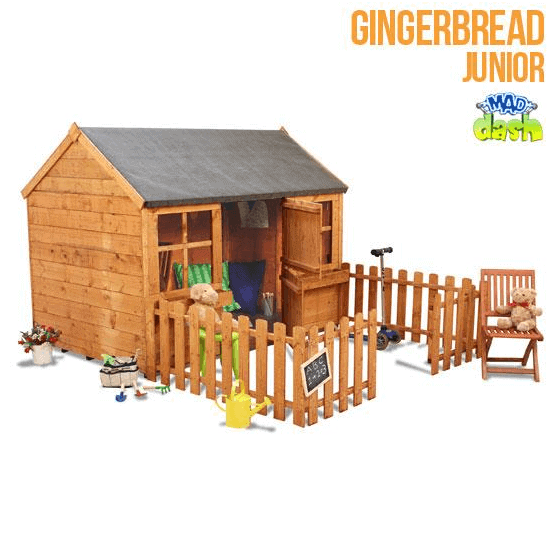 It is a wonderful addition to any garden, affordable too and guarantees hours of fun and role play. Ideal for children age 3 plus. 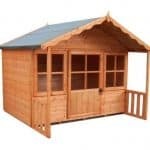 With a charming stable door and large windows, this playhouse will become your child’s new home away from home. 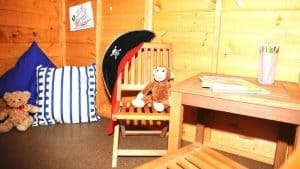 The perfect size and style for preschool children, both boys and girls, in which they can play house, store their toys and enjoy many hours of imaginative play. The picket fenced area makes for a wonderful garden and play area of their very own. Teach them to grow their own flowers and vegetables or simply use it to run around. The Mad Dash 400 Gingerbread Playhouse: How safe is it? With any playhouse, particularly those specifically aimed at preschool children, parents may have concerns about safety issues. Below, the whatshed.co.uk team identify and discuss any features that we feel may be of concern to parents and carers purchasing this particular model. Windows: The windows are open in nature but are styled to have window panes like a traditional house, giving your child the best of both worlds. As the windows cannot be open and closed, they simply allow your child to peep through without the worry of fingers becoming trapped. Door: The door is a stable door that opens at both the top and bottom. Made of lightweight timber, your little one will enjoy the many ways of using the door, coming in and out repeatedly. From the outside there are door handles from which to open the doors, preventing the possibility of fingers becoming trapped. Picket fence: The picket fenced garden is a charming addition to the playhouse. With rounded edges on the fence posts, they contain no sharp edges and are suitable for even the youngest children to enjoy. The wide opening in which to enter and exit the fenced area is wide enough for everyone. 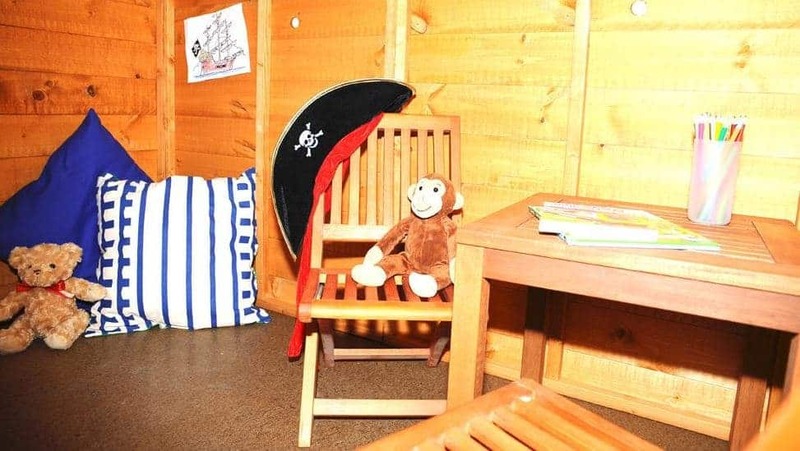 Overall, we find that this is a very safe and well thought out playhouse for smaller, preschool age children. 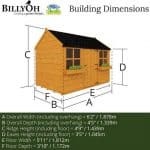 Set out on one storey with simple features that children of this age will enjoy, this playhouse is a great all-rounder for the target market. The Mad Dash 400 Gingerbread Playhouse: How easy to build? In your Mad Dash playhouse package you will receive all of the panels, roof material and picket fence posts, as well as all of the screws, nails and fixtures required for assembly. We expect construction to take two to three hours, building the main playhouse first before adding the fencing and decorative features. With an instruction manual provided, you can follow the instructions and easy-to-read diagrams step by step to ensure that everything goes smoothly. Assembly could be undertaken by an individual due to the small and short size of the pieces, however it is always recommended to work within a team of two for safety purposes. The Mad Dash 400 Gingerbread Playhouse: What is the overall quality like? 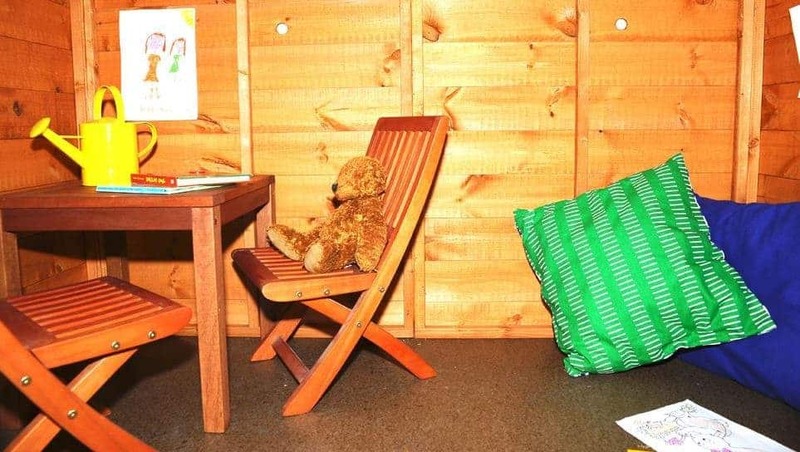 Mad Dash is a British company designing and manufacturing playhouses for children from the age of 3 years and upwards. Great, childlike designs that create many options for imaginative play in the garden are what this company does best. 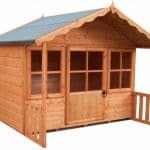 This particular model is made from high quality, lightweight timber. Designed with smaller children in mind, they have kept the design simple, with as few sharp edges as possible to encourage safety during play. The wood is finished so that it will still look as wonderful in your garden and it’s wood tones are as vibrant in five years’ time as there are today. Being fairly low maintenance and designed for a life in the garden, should you need to clean your playhouse then a simple hose down with water will suffice, keeping its smart appearance at all times. 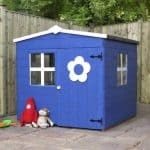 If you wish to add even more character or the personalised touch to your playhouse then the option of painting is there. 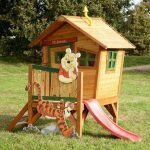 The whatshed.co.uk team feel that this playhouse would provide many enjoyable hours in the garden for preschool aged children. With the perfect size and amount of features for a child aged 3-5, it resembles a traditional style that they will find familiar. 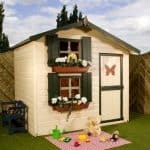 At a mid-range price for a house this size, we feel that the amount of charm and features on offer, prove this playhouse to be excellent value for money. This gingerbread playhouse is well put together. I have 3 children who are kind of rough as they are boys, and this house held up for a long time, and is still going strong. The assembly was quite easy and I didn’t need my husband to help me too much with it. The price was better than I expected for something like this. I always price out everything before I make a big purchase, and this Mad Dash 400 Gingerbread House was within the price range I was willing to spend.